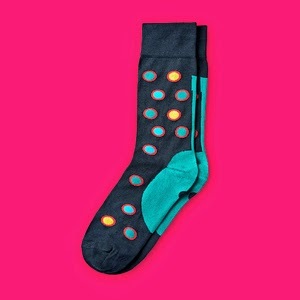 A Gentleman's Luxuries: Blacksocks has turned funky! I've written about subscription services before on this blog, most recently about a newly started company running a subscription service for shaving products. This post will also be about a subscription service, but one that has been around for fifteen years and has proven that this can be a very successful business model. The company I'm talking about is Blacksocks and, as the name suggests, they started out as a subscription service for black socks. Starting a subscription service for black socks is a somewhat ingenious idea. Black is definitely the most worn sock colour and, at the same time, there is nothing exciting about buying black socks. Socks also get worn out and need to be replaced on a regular basis. So, why wouldn't you want socks to be delivered to your mailbox at regular intervals. The number of socks and frequency of delivery is decided by the customer. Now, fifteen years later, Blacksocks has expanded their product range to include different coloured socks as well as underwear and shirts, and with 60 thousand subscribers it's fair to say that Blacksocks are doing quite well. After having tried their socks for a while there is little doubt in my mind that the prolonged success of the Blacksocks service is due to the quality of their products. The socks are very comfortable and when you touch them to get a feel for the quality, it is clear that these are socks which are made to last. Another thing provided by Blacksocks, which I've been missing from just about all other brands, is the ability to get socks that actually fit. The Blacksocks socks come in a wide range of sizes which means you can get socks that fit you perfectly. I'm not going to go into details about the production, materials and specifics about the quality of the socks here, but I would like to refer you to a section of the the Blacksocks website. They have a section on their website entitled "About socks" which is not a huge surprise considering socks are their business. The reason I'm mentioning it, however, is that this section is exceptionally good. A lot of work seems to have been invested in discussing all different aspects of the Blacksocks socks. This is very useful and detailed information about everything from the materials used in the different socks, how the quality of the socks is tested and maintained, where the socks are produced, to a lesson on the history of socks and sock survival tips. I found this quite interesting to read and I think many companies could have a lot to gain from providing their customers with this much information about their products. The latest addition to the Blacksocks assortment are the Funky socks and these are the ones I've managed to get my hands on, or should I say feet. 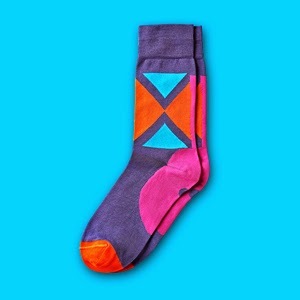 These are what I would call statement socks, socks with bright colours and bold patterns. 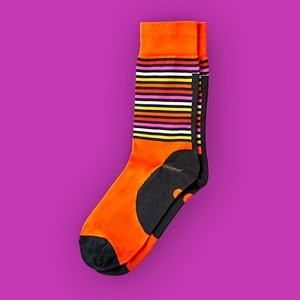 There are six different Funky socks, divided into three different patterns with two colour schemes each. I have a particular liking for dotted socks, so that's the ones I've got, both the blue and the black. I definitely like both socks but I must say that I've been particularly taken with the blue ones. I love these socks and I really think they can do a world of good to an outfit. These are also the ones you can see me wearing in the photos below. However, if I were to put my finger on one thing, it must be the length of the socks. I've come to understand that I'm in no kind of majority when wanting longer socks, but I do prefer socks which stretches above the calf. Blacksocks offer calf length socks but not in the Funky range. Anyway, these are brilliant socks and I doubt my slight issue with the length is going to bother too many. unexpected joy to the day. 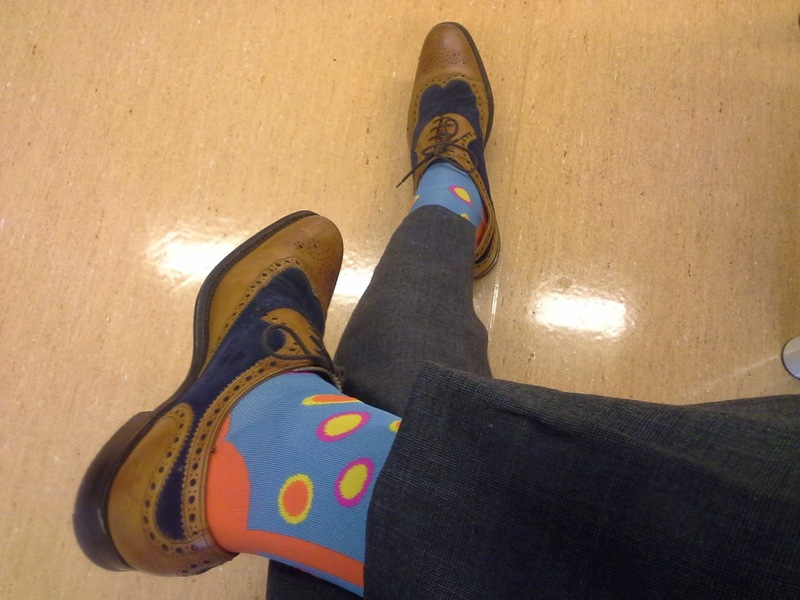 Below are photos of the three Funky socks designs. All photos are taken from the Blacksocks website. With regard to the other products offered by Blacksocks, I am keen to try out their undershirts. In my experience, it can be difficult to find good quality undershirts. A good undershirt needs to have a low neckline, so not to interfere with the shirt collar and Blacksocks have two models which would work nicely: the T-shirt Claudette and, the one I prefer, the tank top Colette. Photo: Taken from the Blacksocks website.